Lotus team principal Eric Boullier says Romain Grosjean "cannot afford" another crash-strewn season. In his first full F1 season, Grosjean was involved in eight collisions with other cars early in races - one of which led to a one-race ban. Asked whether this season was Grosjean's last chance, Boullier said: "Well, it's not his last chance. "But F1 is a tough world and obviously we definitely cannot afford to have another year like last year." Grosjean was quicker than his former world champion team-mate Kimi Raikkonen in 10 of the 19 qualifying sessions they did together, but the Finn outscored his team-mate 207 points to 96. Raikkonen finished third in the championship with Grosjean only eighth and had the Frenchman been more consistent, Lotus may have been able to beat McLaren to third place in the constructors' championship, which is their target for this season. Boullier said he wanted Grosjean "to show us some - let's call it basically - maturity. I prefer him to go for a fourth place than try to be second and crash. "That would show me someone who understands why he is racing in F1 and what he is racing for." 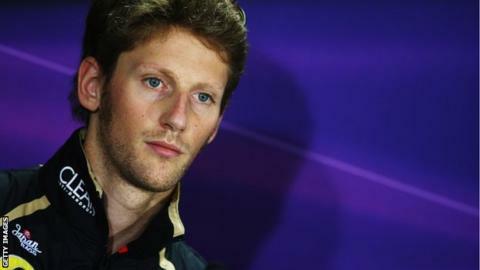 But he admitted there was some doubt about whether Grosjean would be able to do so. He said: "Yes, there is a big question mark about his reliability - will he be able to overcome this, to finish races, because in the end we need the points. "But at the same time you have somebody who has something special and you have to try until you establish he can't do it, or if he can do it." Lotus took until Christmas to confirm Grosjean's position in the team for 2013 and Boullier says this was because they were trying to establish that the driver realised what had gone wrong with his driving last year. "We had a full understanding of what was wrong," Boullier said, "but we needed to make sure that he had one, too. "If you don't have the full understanding of the problem, you cannot fix it." He added: "We had a very lengthy discussion; three hours I remember. And the only point was to get his knowledge about what was wrong. "The complexity of the Romain case was it was not [only] because he was over-aggressive. That was one of the reasons why he had a couple of contacts." Boullier feels the decision by Renault to drop Grosjean at the end of his first half-season in F1 during 2009 has affected the 26-year-old. "His past experience was a trauma for him and he wanted to show everyone he had his place," he said. "He is talented enough to be in F1, so he also put some extra unnecessary pressure on himself. There were many other reasons. "We found out there were maybe three or four reasons which, depending on the scenario, were putting him in the wrong place [on the track]. "Even if he was not directly responsible for the touch, he was in the wrong place anyway. "So we took time. Some of the reasons were easy to raise and fix, some were a little less easy. It's unreasonable to blame him for this year. "A lot of champions had [difficult] moments at the start of their career. If he has the profile of a champion, he will fix it and get the best out of himself this year."